Much of the local history recalled on this site relates to the Victorian period when Strathbungo was built. 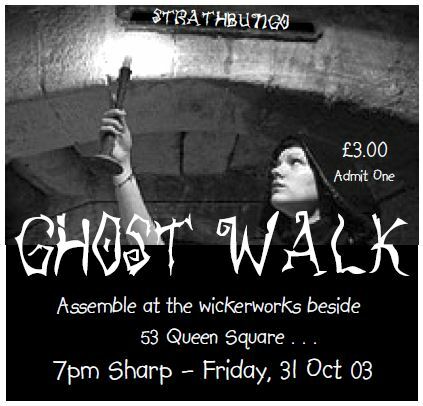 In 2003 the Society was awarded a Heritage grant from Awards for All to stage a number of special activities, and the first of those became the Strathbungo Ghost walk. 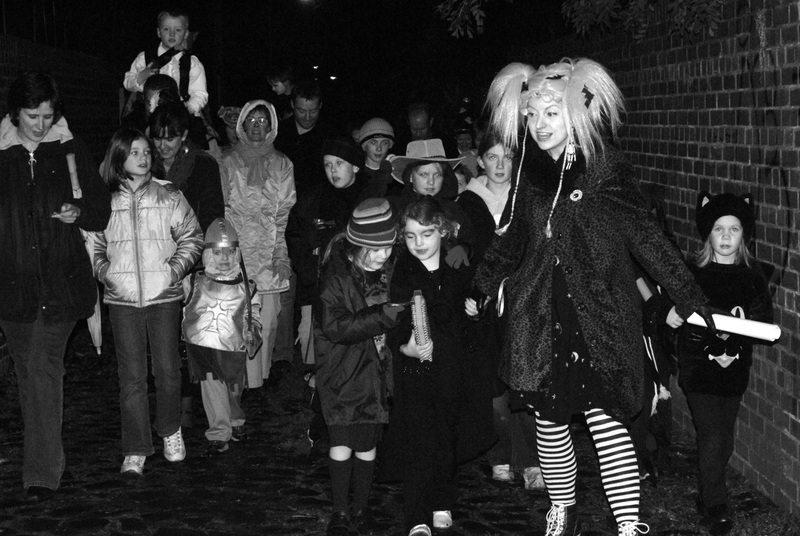 On the night of Hallowe’en, if you were lucky to have one of the fifty or so tickets, you would have been invited on a journey through the back lanes with a Society guide, on the lookout for ghosts and the like for a little Hallowe’en fun and playful rhymes. What actually happened would therefore have been something of a shock, not least for one last minute participant, a tourist visiting from the USA who got much more than she bargained for. The group were led round the lanes not by the guide, but by a mysterious cloaked ghost. 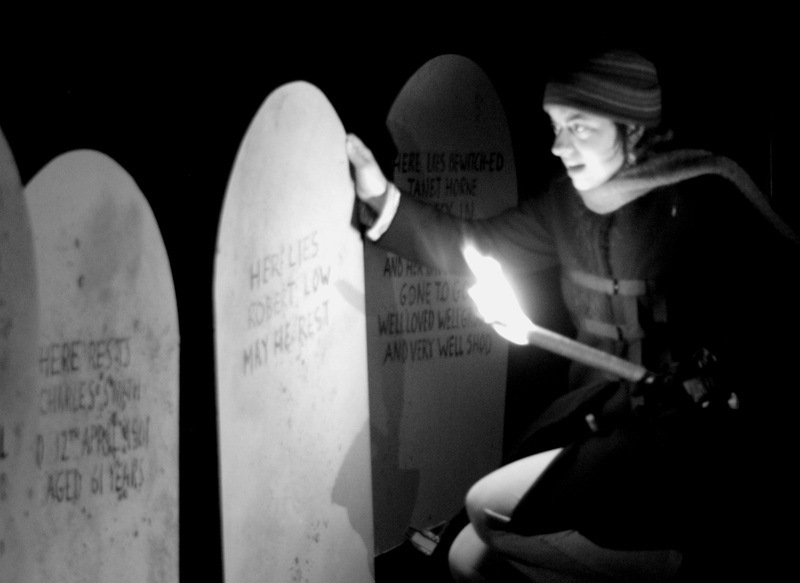 They met one of Scotland’s most notorious witches, heard Mrs Thomson playing piano in her front parlour at No 1 Moray Place, and met Strathbungo’s most famous fictional newspaper columnist, Sir Jeems Kaye, preparing his copy over a whisky glass – or bottle – , before a final (very final) denouement in the Bungo cemetery. Sharon Schweps, one of the contributors, remembers how things came about. 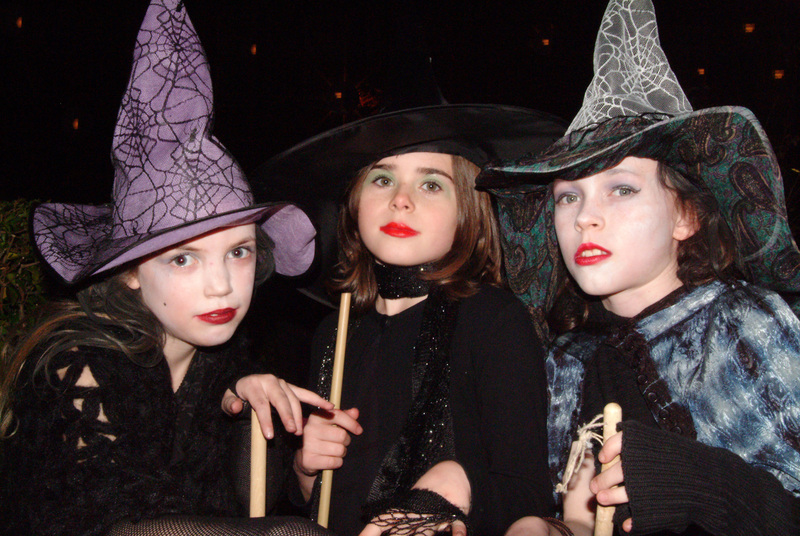 The Strathbungo Society had staged several Halloween parties for local kids in previous years, but in 2003, when Halloween happened to fall on a Friday night, a small group of us decided to do something new. Our Victorian cobbled lanes have always figured prominently in the Society’s business, whether in efforts to get them upgraded or through events such as Bungo in the Back Lanes. 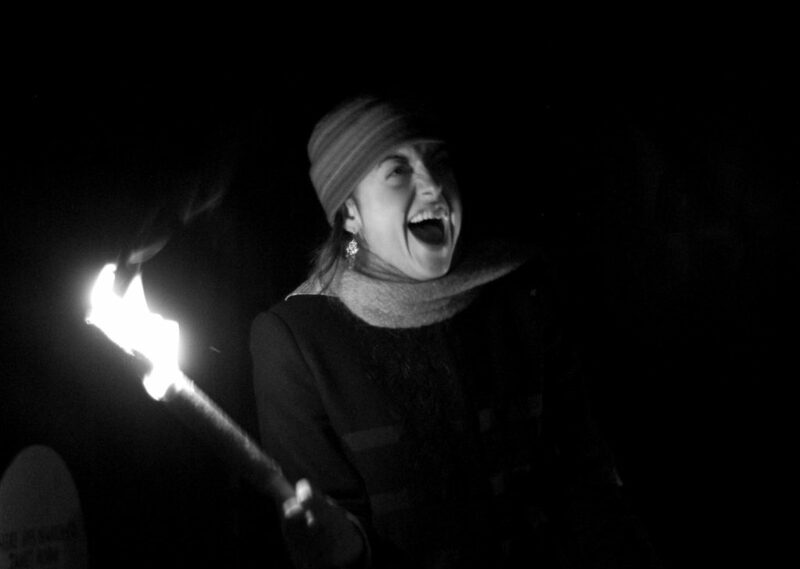 We reckoned they would be the perfect setting for a Ghost Walk – ancient, atmospheric, downright spooky of a dark night. First thought was to simply do a historical tour round, using the ‘ghosts’ we had unearthed in our research. 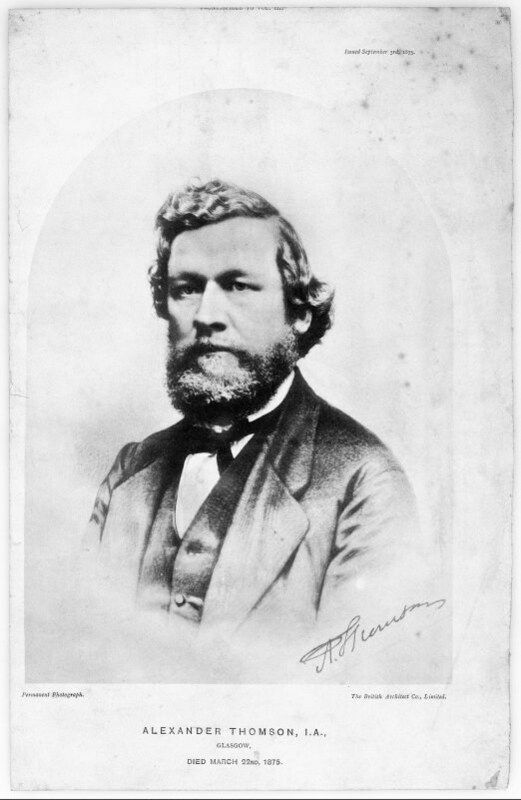 That included our founder Greek Thomson, of course, but another real-life former resident was Archibald MacMillan who wrote a weekly column in the 1870s under the pen-name of Sir Jeems Kaye. As Strathbungo never had any witches to speak of, we settled on the hapless Janet Horne of Dornoch (‘High Strathbungo’) who in 1727 was the last person burned for witchcraft in Scotland. That seemed like a plan, but our resident story-teller Kay Caldwell wouldn’t hear of it – instead she produced a complex script, built round those ‘ghosts’ but filled with rhymes, riddles and anagrams, and introducing the character of an American tourist who had come to Strathbungo to trace her ancestry. It was part history, part pantomime, all good fun – and quite a challenge to pull together. An American performance artist recently settled in Glasgow, Kate E Deeming, was recruited to play the lead, Ruth T Batsong, while locals would take the other parts. 26 Marywood Square: where we discovered the Auld Bungo Burying Grounds and all was revealed. 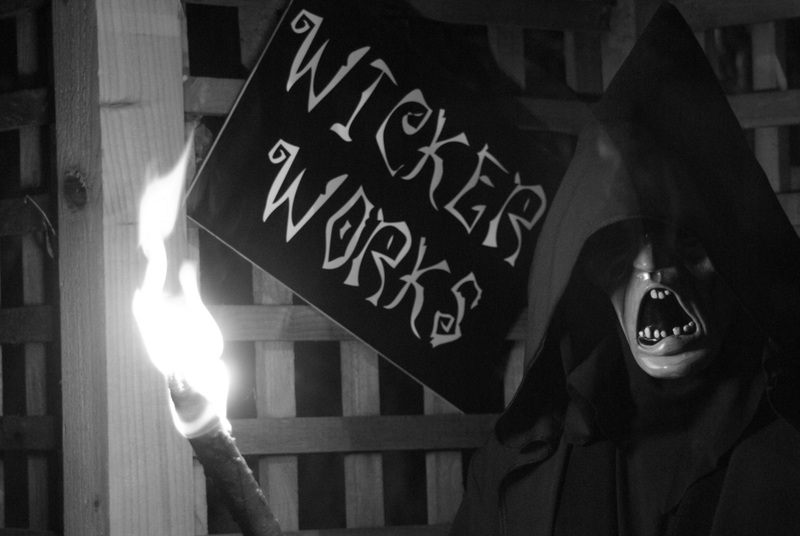 That turned out to be quite a trek so we introduced a black-cloaked spook who beckoned walkers to follow. To avoid attention we set this for 9pm the night before, with all of the actors and most of the props in place. It gave us a chance to see what worked and what needed ironing out – we kept the music and sound effects low, but to our surprise the screams were so realistic that we suddenly found we had an audience – the police, responding to calls from worried residents! Two coppers drove up the back lane in their patrol car. On meeting a bunch of ghosts and witches in the back garden, they gave a friendly wave and scarpered without a further word. Who know what they made of it. During rehearsals, a fearful Ruth calls out Polis, Polis? The spirits were with us and we got the perfect night – cold, crisp, dry but with a hint of fog – spooky. We had planned to give only one performance and reckoned 25 people max as the most we could get round the lanes and crowd into the gardens. In the event we were so over-subscribed we had to put on a second show, with just half an hour between to get everybody back in place and set to go again. Joanna Murphy’s role was to rehearse the children in spells and rhymes along the way and she did this with her 3-month old daughter strapped on her back. Wee Catherine got a quick feed between performances! 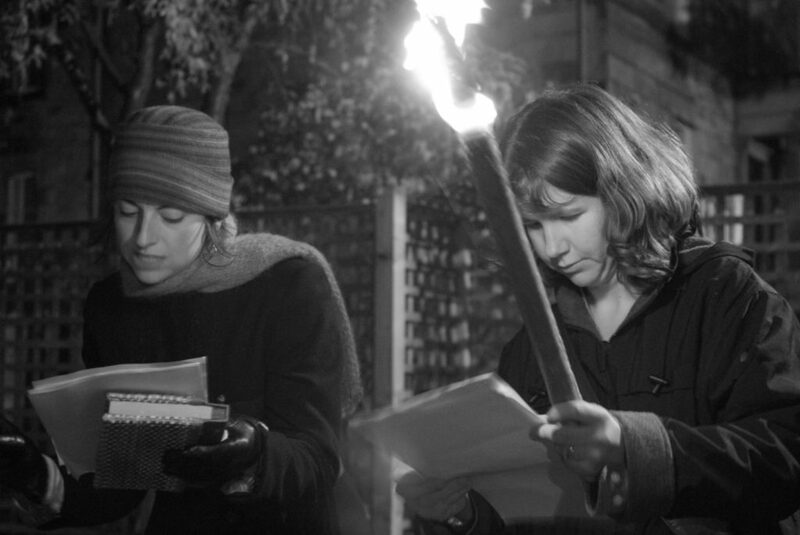 Young Francesca Lacey, who was to play Janet Horne’s daughter Beauty, had earlier that day appeared with her two siblings on the Richard and Judy Show, reciting the Weird Sisters ‘double double toil and trouble’ scene from Macbeth. This was organised by Dominik Diamond, their neighbour in Regent Park Square. The mysterious cloaked ghost, complete with scream mask, top hat & cane, was required to fade away at the various scenes, before mysteriously reappearing to lead the audience to the next. In Moray Place he was taking refuge in the porch at No 3, when a five year old Ruth Jahoda came to the door, and promptly got the fright of her life. Oops. She’s fully grown now, and hopefully no longer has nightmares. Sharon Schweps, who was wrangling the tableau of Sir Jeems (portrayed by local journalist and bon vivant Jack MacLean), was horrified to see the bottle of whisky had gone down by two-thirds between the first and second performances. It took some determined prompting to get Sir Jeems back on the script! Kay Caldwell remembers how successful the finale was. The Lambs’ back garden (better known these day as the Back Lanes Tea Garden) was filled with tombstones and coffins, and a smoke machine created a Victorian smog that would have done Dickens proud. 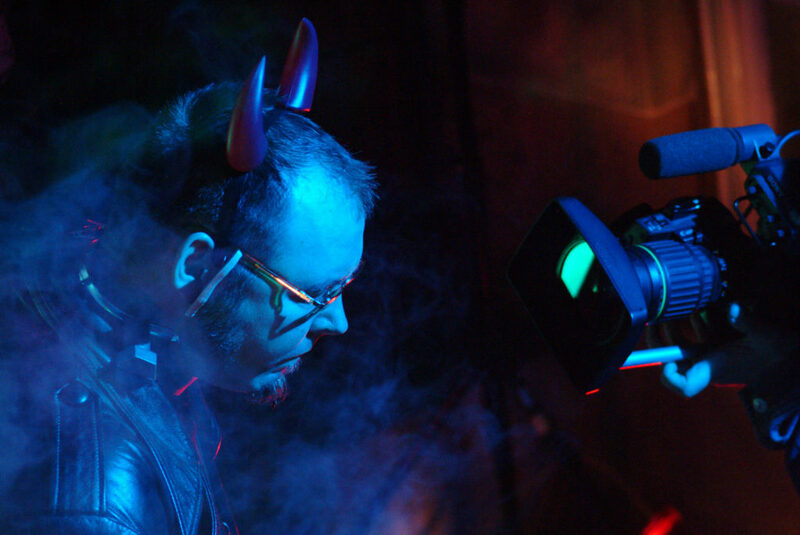 Joe McGinley was stationed behind black drapes with a huge sound system where he produced a wall of music and cacophony for the climax, punctuated by wailing and screams (some of them coming from the audience). Fade to Black. A moment of stunned silence, then lots of laughter and applause. A great night in the Bungo! So who can top that? Window Wanderland returns in the Spring of 2018, but what other arty adventures could Strathbungo produce? Any ideas? In something reminiscent of a Hollywood “found footage” drama, a version of the script has recently been unearthed, and is reproduced here. Joanna Well now that we’re all here, we’re going to be going round Strathbungo and we might see some scary figures. 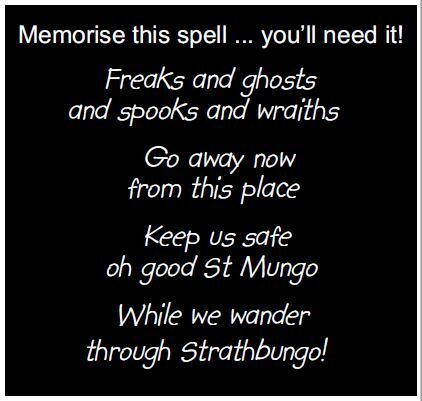 So we want to learn a spell to keep the scary things away. Are you ready? Joanna Let me hear it again. That’s not loud enough! Joanna That’s better. Now I wonder what we should do next? I thought there would be witches and ghosts here to meet us. 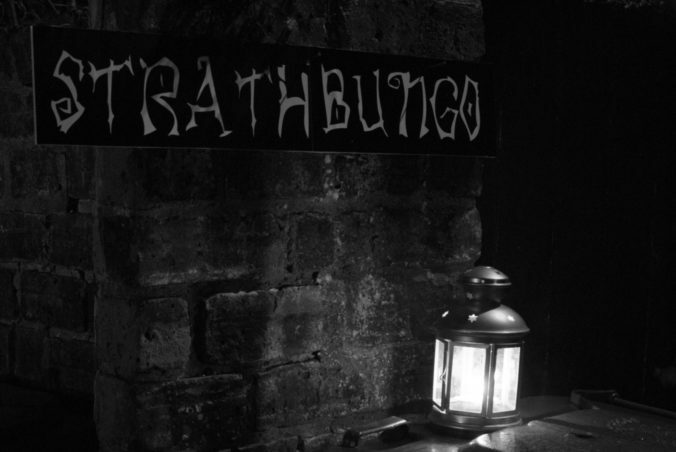 I wonder if the Strathbungo Society have got the dates mixed up. This is Hallowe’en – isn’t it? Oh dear, what should we do? Ruth (played by Kate) Well, if you’re all here doing nothing, maybe you could help me. I’ve just arrived in Strathbungo – I don’t live here. I’m from America but I think my great, great great grandfather once lived in Strathbungo and I’m trying to find out who he was. If we’re all hanging around here doing nothing maybe we could see if we can find anything out. Would you be prepared to help me? Ruth You see, I’ve got this book, this diary that has been in my family for a long long time. It’s my great great grandfather’s diary. And he has something to say that’s made me come all the way from America to find him. Do you want to hear? Children We want to see witches and ghosts. Ruth Well you know, I think there’s something spooky about this diary. Listen to this: It’s written on Hallowe-en, 1903 – a hundred years ago tonight. The story of my journey not yet known. Ruth/Kate embellishes or repeats so that children know what it’s about. Ruth I think we’re looking for some sort of design, or wiggly line and a plate and a cup. (To Joanna) Do you think we could go and look for them since we’ve nothing else to do? Joanna Well Ok. But I think there might still be spooky things out there. Can we do the spell? Ruth That’s great. That will keep us safe. By the way my name’s Ruth Batsong. A clue leads them to Janet’s. Was this the clue that Anne is writing – and where do they find it. Ruth leads the party to Laura Davie’s garden. Act II, Sc1 The farm of Janet Horne in Nithsdale Street. Janet is frantically washing things in a cauldron and hanging them out to dry on the line. They turn out to be an assortment of bats, fingers, severed hands, spiders and other hallowe’enalia. Bubble machine is churning bubbles all around. (aside) Beauty, my darling daughter, where are you? The girl is never here when I want her. (to Ruth) But why are you here? Why have you all come to my farm? Is it just to visit a poor old wifey? Janet “Hmm. Hmm. Maybe I remember something. Ruth (encouraging consternation amongst children) No, I don’t think the children want horseshoes. Didn’t people think you were cruel? Janet (sadly) Yes they did. They threatened to burn me at the stake for cruelty. I only meant to be kind. Ruth Look, look! That’s a strange pattern on the plate isn’t it? Tell me Janet, did you know my grandfather? Janet I can tell you that there was a little boy who worked in the house at no 1 Moray Place. That was the first house ever built in Strathbungo in 1860. The man who lived in it was called Alexander Thomson. They called him Greek Thomson because he used an ancient Greek design on his buildings. And he lived there with his wife and children. But sadly his children died. But there was that little boy who worked there, cleaning the kitchens and the chimneys. There was a strange story about that little boy, but I don’t know it. His name was Stan, Stan Brough. Stan T. Brough. Could he be your great, great, grandfather? You must find number 1 Moray Place and you must find another clue there. Upstairs neighbour (opens window and shouts). What’s that racket down there? Is that Janet Horne and her weird friends again? I’ve had enough. Another neighbour (opens window and shouts) Me too. Burn the woman. She’s always complaining she’s cold. Heat her up! Heat her up! First neighbour Yes – heat her up! Heat her up! Torchbearers approach from the corners of the garden and surround Janet who is alarmed and confused. Puff of smoke. Janet has disappeared. Ruth Come children, let’s get out of here. I’ve heard that Janet was the last witch to be hanged in Scotland. We don’t want to see her hanged. We’ve got to find no 1 Moray Place. I wonder if anyone will help us. Noises off: loud knocking at gate. After pause, Ruth gathers children behind her and they set off down the lane. They notice the severed arm in the wheely bin as they pass. In the distance a shadowy, cloaked figure beckons to them. He is always just about to turn a corner when he turns back to them and beckons. 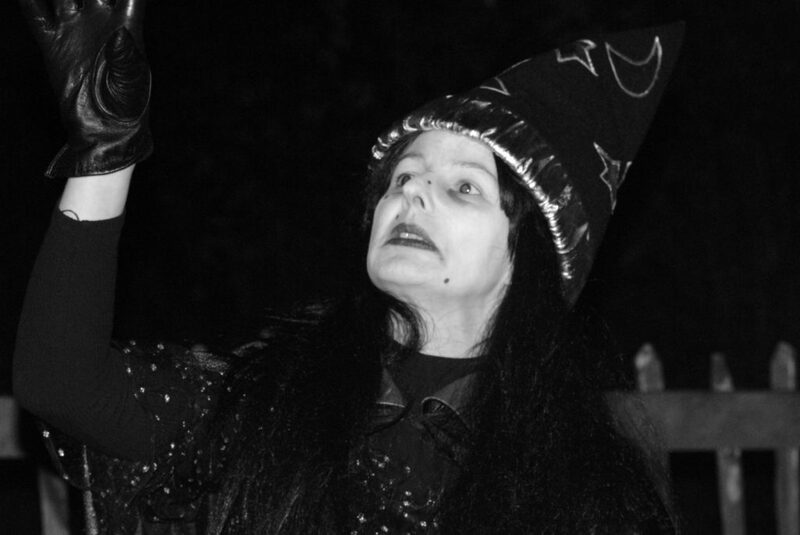 Ruth gets the children to chant their spell. Act II, Scene II No 1 Moray Place: Greek Thomson’s House. A child (perhaps) Here’s a bit of stone with it on. Ruth Good let’s take it. What’s that beside it? It looks like a message. We need to find this man. Who will show us. 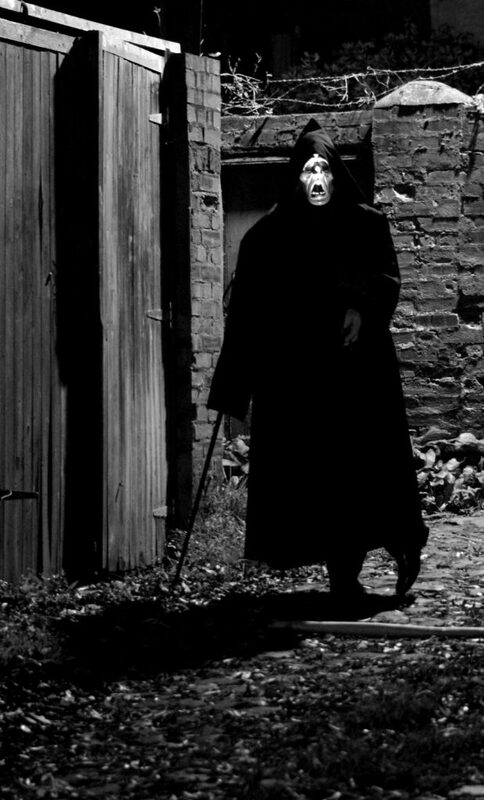 (looks up and sees the cloaked figure further along Moray Place – beckoning!) Look, there’s our friend – do you think it’s Greek Thomson? Let’s follow him anyway. Act II, Scene III Group arrives at back of 42 Queen Square to find a candle-lit scene. 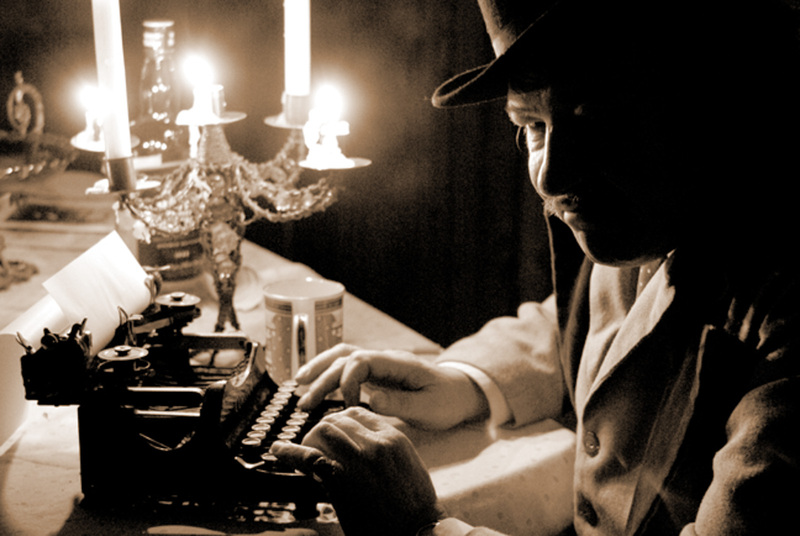 An older man sits at a table using an old-style typewriter. Candleabra on table, bottle of Strathbungo whisky and a glass. Cobwebs etc. draped round. Ruth The man is writing something. It looks like a report for a newspaper. Let’s be quiet and listen to him…..
Ruth But was that boy you’re writing about. Was that my great, great grandfather – do you know anything more? Was that how I came to be an American? Jack I don’t know. Is there anything to connect me with your great, great grandfather? I remember that boy – but was it him? Ruth “I’ve got his diary and he tells me to look for some things with a pattern on it. Do you have anything like that? This must be the clue. You must be the connection to my great-great grandfather. Please can I take the cup. Perhaps I can find who I am and where I came from at last. In this place or somewhere further on? With answers that will rest your mind. Now go, and let me get on with my column for tomorrow’s Glasgow Herald. The lane that’s to the west – that’s this one here and take the turn that fate suggests – I wonder if our friend Greek Thomson will be there to direct us. Let’s look. Are you ready? I think we should say our spell now – we’re going to a cemetery and there are always ghosts and spirits and spooks in burial grounds. Children The children chant the spell. Act III, Scene I Arrive at burial ground. Music, smoke, etc. Some time to enjoy effects. Is this the end – is this where the journey stops? What do you think I’ll find here? So Janet’s dead…..how can that be? … we were speaking to her just a while ago…we saw here…as large as life…. But look – there’s another one! But Greek Thomson brought us here – he’s been leading us round Strathbungo – this is scary. Children I need you to say your spell. Oh no – here’s another one. It’s – it’s Sir Jeems, it’s the man who told us the story of the shipwreck……. I don’t like this. I’ve found them all. All these people had clues about my great grandfather – that little boy must have been him because Janet had the plate with the design, and Greek Thomson’s house had the design and Jeems Kay had the design. They must have all known my grandfather – but they’re all dead. How can I be talking to them if they’re dead? Oh, what was that? Someone must be walking on my grave. That’s today, it’s tonight. I have died today. Oh my God! I remember now – it was so scary – I was on the ship that was coming from America. And I was leaning over the edge of the boat trying to feed a seagull – and I fell into the water. I went down, and down and down, and I thought, I’ll never come back on. I am drowning, drowning, drowning. (sobbing) And I never came up. I died in the water on my way here. Maybe where my great-great grandfather’s ship sank. (recovering) So – I’m dead and I’m a ghost and that’s why I could talk to all these people – they’re ghosts too. I’ve found my family but not the way I wanted. Janet, Greek Thomson and Jeems Kay appear from behind quietly then all talk one after the other. Jeems Kay Come in Ruth, we’ve been waiting for you. Janet For a long, long time…..
Greek Thomson Like us, you’re a ghost, you have crossed over to be with us. Janet We knew you’d come, everyone comes here in the end. Ruth T Batsong and her great, great, great-grandfather Stan T Brough; strange names, yet oddly familiar to anyone who lives in a well known south Glasgow suburb, and is good at anagrams. Alexander “Greek” Thomson was born in 1817 in Balfron, Stirlingshire, the 17th of 24 children. When his father, a bookkeeper, died in 1824, his mother brought the younger children to Glasgow where Alexander eventually parleyed his notable skills as a draughtsman into an apprenticeship with the architect Robert Foote. In 1847, now a successful architect in his own right, he married Jane Nicholson, who bore him 12 children, only seven of whom survived infancy. It was perhaps the memory of those lost children in the dirty industrial gloom of Glasgow that inspired him to design and build Scotland’s first “railway” suburb, aiming at the wealthy business and professional folk who could afford the luxury of clean “country” air in the quaint outlying village of Strathbungo. Indeed, he moved his own family into No 1 Moray Place and lived there until his death, aged 57, in 1875. Thomson is regarded as the greatest architect of Victorian Glasgow and in recent years has been steadily gaining on Charles Rennie Mackintosh (who, incidentally, lived for a time in Regent Park Square). He owes his nickname to the inspiration he took from classical civilisations as he created startlingly modern buildings for his times. Ironically, he never went to Greece – he never even crossed the English Channel! 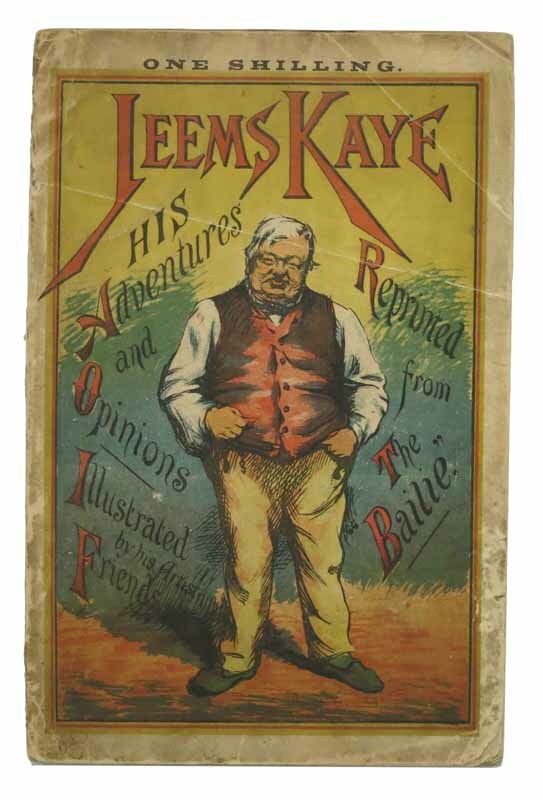 Sir Jeems Kaye was the nom de plume of Archibald MacMillan, who wrote a weekly column for The Baille, a humorous journal that satirised, among other things, the “parasites” who lived outside Glasgow’s boundaries but used its services. 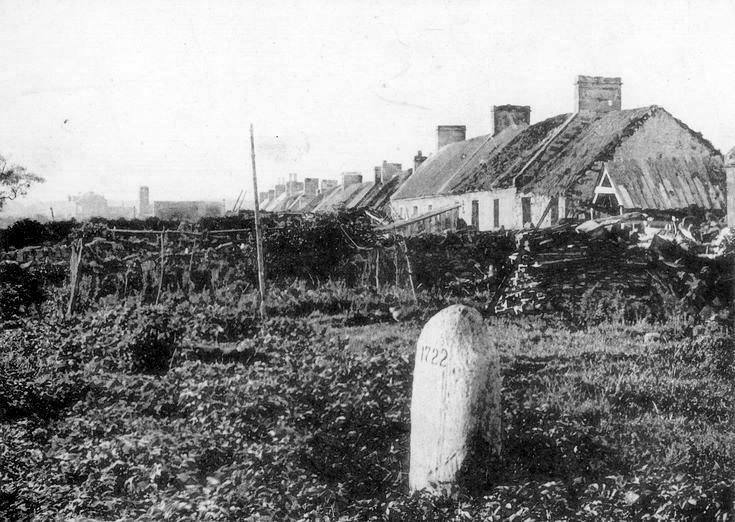 In the 1870s and 1880s, when MacMillan was writing his columns, he used Strathbungo’s village mentality to send up the suburbs as small-minded and parochial. Each week Sir Jeems – Coal Merchant, Purveyor of Hams to the Queen, Col of the 1st Royal Stra’bungo Fusiliers and Provost of the Burgh – went on at length. Indeed, Sir Jeems, his wife Betty and a cast of local worthies who populated Strathbungo – and his column – had something to say about all the popular issues of the day. MacMillan, who lived in Strathbungo, reputedly based his characters on real life folk in the neighbourhood. He died in 1925. It is only fitting that his modern counterpart, Jack McLean, the former columnist for The Herald, portrayed Sir Jeems for our Ghost Walk.